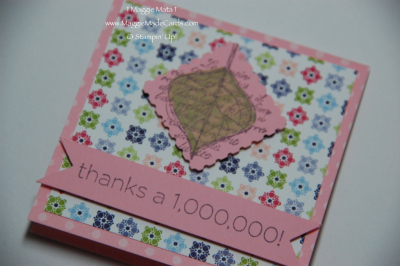 Home Posts tagged "pretty in pink"
[pinit]I LOVE this pretty in pink thanks a million card! The Cheerful Treat DSP paper is one of my favorite patterns. I’ve used this one the most since becoming a Stampin’ Up! Demonstrator and I need to re-order more because I’m running low. It’s definitely cheery and will brighten anyone’s day. If you haven’t received your Occasions Mini Catalog just send me an email (maggiemadecards@yahoo.com) with your mailing address and I will get one to you ASAP. It closes on April 30, 2012.
for supplies to make this cute little THANK YOU card.